The great struggle of life is the struggle of understanding the Self. It is not the struggle to put food on the table, though that is often a great struggle (and for many it is a primary struggle). It is not the struggle to establish justice, though that struggle is an obligatory struggle. But, it is the struggle to know the Self. If you know your Self, then you can excel in these other endeavors. If you do not know Self, then how can you expect to have any sustaining, lasting change? To change something within us, we need to know what is specifically broken or what needs to be changed. Meaning, we need to know what is a symptom of a disease, and what is the actual disease. Often, people cure symptoms, and overlook the diseases. Thus, in our goal to figure out what is the true condition of the heart, where should we look? When you lift your hands up in prayer to God, speaking to Him in your own words, making your own statements to Him, you are doing two things. But, when you are lifting your hands you are also holding a mirror. That mirror in your hands is reflecting your heart. What you ask God, how you speak to God, and what you do not say to God are all reflections of what is your in heart. There is nothing between you and God at that moment. For many, there is a common barrier in the steps of the formal salah, being the language barrier. Many of us diligently, sincerely perform our prayers, yet we do not know what we are reciting. 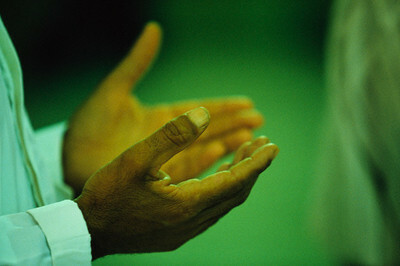 But, when you are lifting your hands in du’a, there is no barrier. It is you at your most intimate with Him. Thus, we often have yearnings in our heart that we bury so deeply under piles of excuses and criticisms, that we lose sense of what those yearnings really are. Thus, we censor ourselves even in our most intimate moments, speaking with the One who knows us so thoroughly. How can that be? Well, it is something that so many of us do. So, cure that self-censorship. Ask Him. Even if you have to say to Him, “Dear God, I know I deep down I yearn for something, and I know I keep turning myself away from it. Show me.” Without that honesty, how can we yearn, as did Moses -p- when he asked to see God? Without that honesty, how can we yearn, as did Abraham -p- when he asked God to show him how He gives life. That greatest of yearnings, the yearning for the Divine can be unlocked when we unlock all those doors within us that we have closed. Now, consider that other person who does not speak to God. S/He never makes du’a at the end of the salah or at the beginning or end of the fast, or elsewhere. S/He might fulfill all the external obligations and voluntary acts in service to Him. S/He might fulfill all the ritual obligations and voluntary acts in service to Him. But, when speaking to Him, s/he is silent. S/He ends the salah or ends the fast abruptly, never speaking to Him. Or, when speaking the du’a is something very functional, without life and with, of course, heart. How can that be? Nevertheless, we know that that person will be fully rewarded for each of those acts. Consider that Allah is closer to us than the vein in our neck? What is closer to us than the vein in our neck? It is our heart. May Allah open up our hearts and grant us His intimacy.